Contractors specializing in Tremco Roofing, Commercial Roof Repair, Commercial Roof Construction, and all other Tremco Commercial Roofing Services in CT. Call 1-888-766-3020 for a Free Quote. Since 1928, TREMCO Inc. has been the leading innovator and provider of roofing and weatherproofing solutions. Tremco offers the most comprehensive roofing and weatherproofing solutions for new construction, roofing maintenance, replacement solutions, restoration and repair services, and roofing materials in the industry. Tremco delivers long-term performance to building owners and facility managers for roofing and building assets by caring and managing the life cycle of the entire building envelope. New Roof Connecticut’s licensed and insured roof contractors have years of quality commercial roofing experience in Middlesex, Litchfield, New Haven, Fairfield, Hartford, New London, Tolland, and Windham County. We service all types of buildings and market segments including commercial offices, government buildings, medical offices, hospitals, schools, banks, industrial buildings, residential homes, commercial buildings, housing associations, and apartment buildings. Call New Roof Connecticut 1-888-766-3020 to learn about our Tremco roofing solutions or request a Free Commercial Roof Quote. Restoration is a cost-effective, proactive maintenance process designed to prolong the life of a functioning built-up, modified, singly ply or metal roof. Restoration upgrades the performance of your existing roof and its components by identifying and repairing defects in addition to providing a new top coat to restore waterproofing continuity. Tremco also offers roof restoration options for gravel, metal, and smooth roofs. 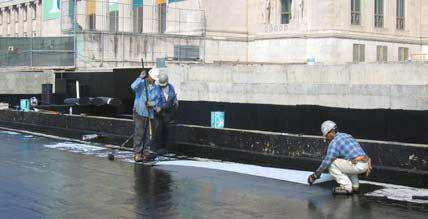 Tremco’s gravel built-up roof restoration process uses a cold applied, high performance flood coat of waterproofing bitumen that reconditions the surface of an aging built-up roof. Gravel is embedded for maximum impact and fire resistance. Tremco’s metal roof restoration system uses a highly reflective coating with exceptional elastomeric qualities that provides a reflective monolithic film that accommodates metal roof movement while reducing surface temperatures. Tremco’s smooth roof restoration process can be used on either smooth built-up, modified or single-ply roof systems. It uses either a high solids, low odor elastomeric white roof coating, or a fibered aluminum coating which form a super bonding, durable layer of high performance defense from the weather and sun. 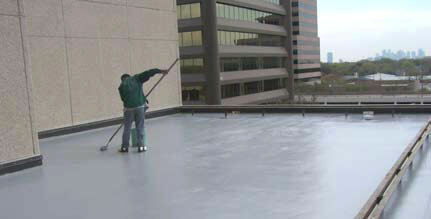 Both provide a thick, protective surface that helps seal out moisture and resists roof top traffic. Tremco's product line of roofing systems include Cold Applied Built-Up Roofing Systems, Flashing Systems, Hot Applied Built-Up Roofing Systems, Metal Wall Systems, Metal-Over-Metal Roof Systems, Modified Bitumen Roofing Systems, Pre-Engineered Edge & Counterflashing Systems, Pre-Engineered Truss Systems, Single Ply Roofing Systems, Standing Seam Metal Roof Systems, and TremLock SLOPE Framing System. Tremco remains committed to staying on the leading edge of Sustainable Design in the roofing industry by constantly developing products that not only offer superior performance, but also offering customers increased value. For more information about Tremco Roofing Solutions please visit the Official Tremco Website or contact our Roofing Experts 1-888-766-3020 for more information. Please also feel free to request a Free Commercial Roof Quote.